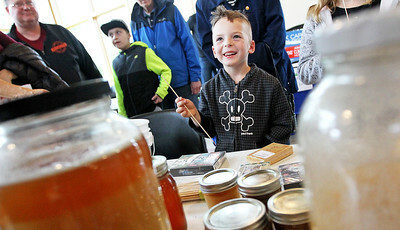 Candace H. Johnson-For Shaw Media Joe Tardi, 5, of Antioch (center) is all smiles as he listens to Edward Popelka, a beekeeper with Special Bee, talk about how bees make honey during the Village of Antioch’s Eco Fair at the Antioch Township Center in Lake Villa. 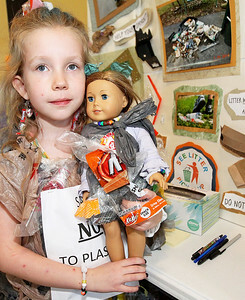 Candace H. Johnson-For Shaw Media Anna Bell, 8, of Antioch with Litter Buster stands next to her display and shows how she and her doll are dressed in recycled plastic bags during the Village of Antioch’s Eco Fair at the Antioch Township Center in Lake Villa. 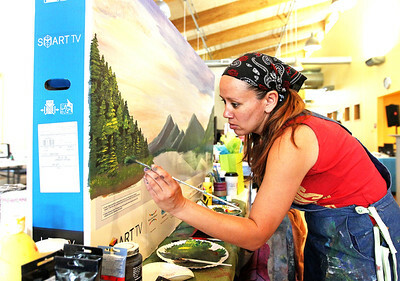 Candace H. Johnson-For Shaw Media Artist Daisy Perez, of Antioch paints a scene of a photo used on the other side of a Smart TV box as she promotes using recycled materials to make art during the Village of Antioch’s Eco Fair at the Antioch Township Center in Lake Villa. 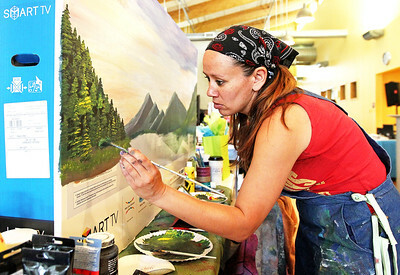 Candace H. Johnson-For Shaw Media Artist Daisy Perez, of Antioch paints a painting of a photo used on the other side of a Smart TV box as she promotes using recycled materials to make art during the Village of Antioch’s Eco Fair at the Antioch Township Center in Lake Villa. Candace H. Johnson-For Shaw Media James Pogue, of Antioch talks with Edward Popelka, of Spring Grove, beekeeper with Special Bee, about bees and honey during the Village of Antioch’s Eco Fair at the Antioch Township Center in Lake Villa. 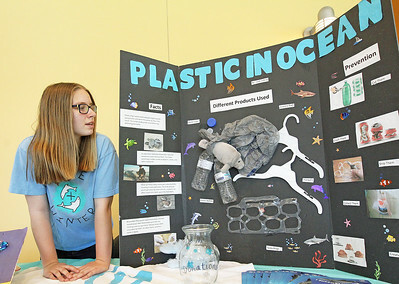 Candace H. Johnson-For Shaw Media Leah LeBrun, 13, of Antioch stands next to her display as she talks about how plastics do not break down if they get into the ocean during the Village of Antioch’s Eco Fair at the Antioch Township Center in Lake Villa. 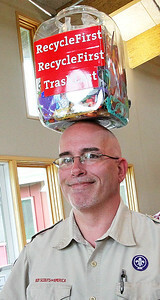 Candace H. Johnson-For Shaw Media Mike Adams, of Antioch with Cub Scout Pack 191 balances a container of freebies on his head with the message stating, "Recycle First Trash Last," as he walks through the Village of Antioch’s Eco Fair at the Antioch Township Center in Lake Villa. 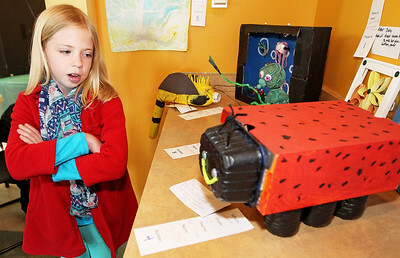 Candace H. Johnson-For Shaw Media Helen Klosinski, 8, of Antioch talks about the lady bug on display she made out of recycled materials which include a shoe box, water bottles and a mushroom container during the Village of Antioch’s Eco Fair at the Antioch Township Center in Lake Villa. Candace H. Johnson-For Shaw Media Fifth graders Kiki Chatterjea, Averie Schultz, both 10, and Flor Segundo, 11, all of Fox Lake prepare donated shoes to recycle for the Reuse-A-Shoe Program at Stanton Middle School in Fox Lake. 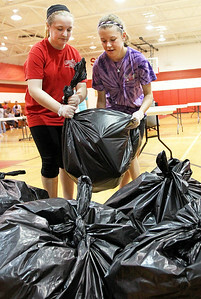 Candace H. Johnson-For Shaw Media Sixth graders Kamryn Paholke, 12, and Tara Levernier, 11, both of Fox Lake add another bag of donated shoes to the pile to recycle for the Reuse-A-Shoe Program at Stanton Middle School in Fox Lake. 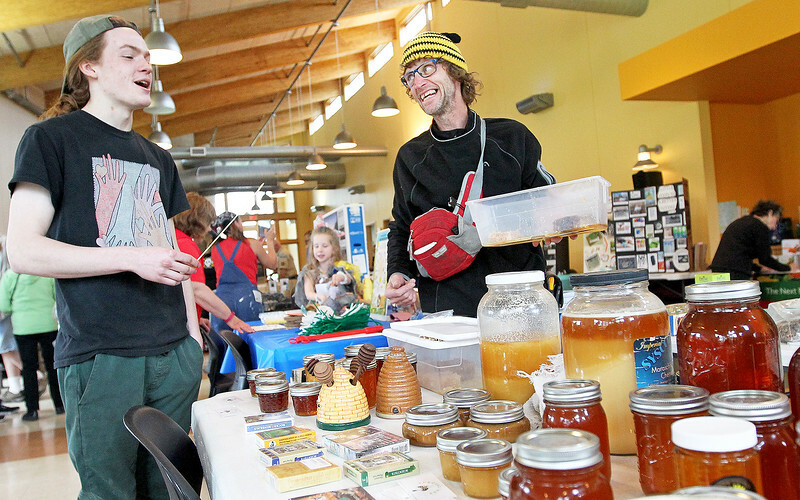 James Pogue, of Antioch talks with Edward Popelka, of Spring Grove, beekeeper with Special Bee, about bees and honey during the Village of Antioch’s Eco Fair at the Antioch Township Center in Lake Villa.